A lot of people have doubts on whether to eat banana or not when trying to lose weight. Not only that, some fitness trainers or weight loss enthusiast will encourage people NOT to eat Bananas because they believe it contain a lot of sugar and is fattening. So the question is, should you REALLY eat banana for weight loss? But, let me explain WHY to you…..
You see….An average sized banana contains about 105 calories. Over 90% of all the calories in that banana contains carbs. Banana’s is also a good source of several nutrients including potassium, Vitamin B and vitamin C.
Banana contains 27 grams of NATURAL sugar. This sugar is COMPLETELY different from the white granulated processed sugar that you add into your tea or drink. This natural sugar is actually called Fructose, and the fructose sugar contained in bananas will not make you gain fat. But that is not all, banana also contain a decent amount of fibre, which makes it very good for you. As long as you are eating it as part of a healthy weight loss diet, it is perfectly nutritious and healthy to eat. What I Mean Is This…. If you consume 1 – 2 piece of banana in a day, it will NOT make you fat. 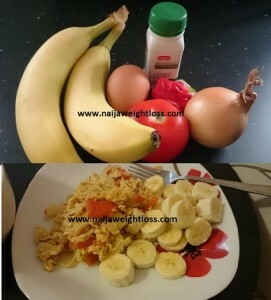 You can actually eat banana as a breakfast meal alongside with egg, just like I have explained in this healthy fat loss breakfast. So when next you eat banana and some ““I know it all” person tells you “Banana is fattening”, you can smile and ignore them because you now know that Banana is good for you if you are trying to lose weight. But just eating banana alone is not enough for weight loss. You need to follow a COMPLETE 100% fat burning program that will help you lose weight easily. This program is for you if you are currently overweight and you want to lose between 15kg – 30kg over a 90 day period. One of my most recent client that signed up for my 90 Day Coaching is Ada, and she lost a total of 31kg of fat. You can see her fat loss testimony, plus her “Before” and “After” picture by clicking here. You too can burn the excess fat, lose weight and get a flatter tummy by signing up for my 90 Day Fat Loss Coaching today. You too can get started today and start losing the excess weight. I’ll be happy to help you achieve this. Simply click the link below to register.